I love curry and the spicier the better for me! I am fortunate that my hubby could take spicy curry too as I cook curry almost every week at home. When we first met, I always ordered for him curry which are mild, but he told me he could eat spicier than that, of course I thought that he was trying to impress me,lol. That was when we were in Asia and we could get any curry almost everywhere easily, no need to cook! Here in the US, where we live, it is quite difficult to get great curry and when you do, it is quite pricey. I usually serve naan, paratha, chapatis with home made dhall or curry chicken and our family loves it. For this bento I decided to add a little Indian twist to hummus with curry. Place all ingredients in a food processor, process till smooth. Enjoy! I packed some for Nikolai's lunch. Main compartment - Stonefire brand naan cut into triangle shapes, topped with a cute antibacterial sheet which my friend sent from Japan. 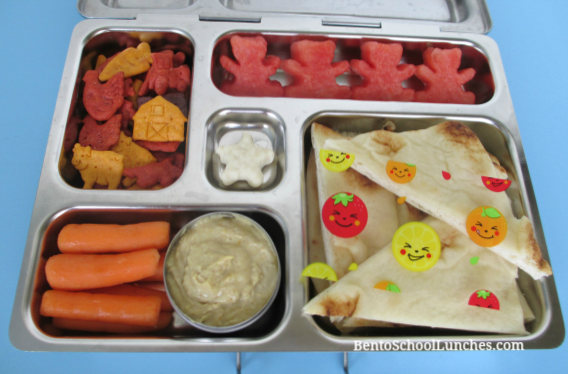 Lower left - Organic baby carrots and curried hummus in the small dipper. Upper left - Annie's organic Bernie's farm cheddar crackers. Upper right -Watermelon cut into bear shapes. Lovely lunch, thanks for the recipe! I need to find those crackers, never seen them before. I love spicy curry too! Curried hummus and naan sounds so yummy, tks for sharing! Yum! Love hummus, and definitely must try your recipe for curry hummus! Thanks for sharing! Thank you Jean! The texture is slightly thicker compared to dhall or other curry.